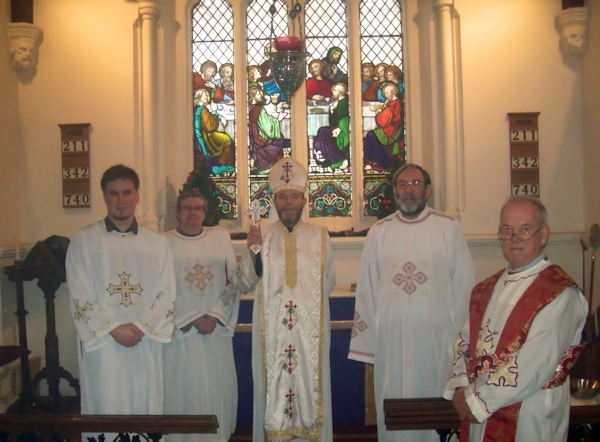 The opening service of the British Orthodox Mission of Saint Polycarp, Southampton, was celebrated on Saturday 17th December in the Anglican Church of the Holy Trinity, Weston. Father Simon Smyth led the celebration of the Divine Liturgy supported by Subdeacon John Morgan from Bournemouth and Readers James Kelly, Daniel Malyon and Antony-Paul Holland all from Portsmouth – all four of them enthusiastic in their support for the small but committed Southampton Mission congregation. Taking his cue from the enforced silence of Zacharias up until the naming of his son John and the Gospel reference to the future John the Baptist being “in the deserts till the day of his shewing unto Israel” Father Simon preached on silence and withdrawing in stillness alone with God. He referred to other examples through the history of the Church: Saint Antony who had withdrawn into the deserts of Egypt before becoming a spiritual guide to so very many, Saint Seraphim of Sarov who similarly spent many years in the forests as monk and hermit before becoming a spiritual doctor to Russia and the Indian Orthodox Saint Gregorius Paramula who again underwent years of preparation and isolation alone with God before his mighty ministry. The sermon also recalled Saint John the Baptist’s great predecessor the Prophet Elijah who heard God not in the wind nor the earthquake nor the fire but in the “still small voice” that followed. Others might have greater numbers and more spectacular and popular ministries but, at least for now, the new Saint Polycarp Mission would meet quietly praying month by month the Monastic Office of Morning Prayer. They would also do well to recall God’s message to Elijah that though he thought he was the only one left there were in fact seven thousand in Israel still faithful to God. Who could say who else or how many else might be in Southampton already looking for just such a Mission? Following the Divine Liturgy Father Simon joined the local Fellowship members for some excellent Lenten refreshments at the home of catechumen Bridget McConnachie. The monthly meetings will take the form of Morning Prayer at 10.00 a.m. on the third Saturday each month at Holy Trinity, Weston, Southampton, with studies in the Epistle of Saint Polycarp. It is planned for different members of the clergy to lead the service different months. There is also to be an annual Divine Liturgy on or about the Feast of Saint Polycarp.